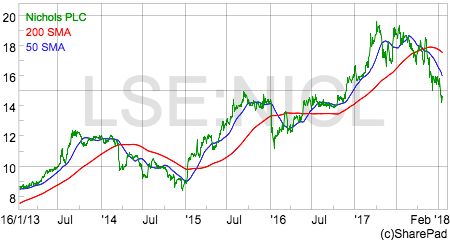 Soft drinks company Nichols (AIM:NICL) has been a good share to own over the last few years. It has many of the hallmarks of a high quality business but its shares have been drifting downwards in recent weeks. This seems like a good time to take a closer look at what has been going on with the business and what its future might be. What do shareholders own a slice of? Nichols sells six main brands of soft drinks as shown in the table below. Vimto Mixed fruit drink sold in carbonated (fizzy), still and cordial forms. Panda Flavoured water and fruit drinks aimed at 4-8 year olds. Sunkist US branded fruit drinks made and sold under licence in the UK. Levi Roots Licence to sell tropical and fruit flavoured drinks. Noisy Drinks Frozen drinks such as Starslush, iced coffee drinks and iced milkshakes. Feel Good Drinks Drinks with 100% natural ingredients and no added sugar. The Vimto brand dominates the business. It accounted for nearly 80% of Nichols’ UK sales in 2016 and the vast majority of its overseas sales as well. The company also makes money from licensing the Vimto brand to other companies who then use the flavour to make products such as sweets, iced lollies and even lip balms. UK sales of soft drinks accounted for 77% of total sales in 2016. Drinks are sold to supermarkets, wholesalers, pubs, bars, restaurants and leisure outlets. The overseas business is dominated by sales to Africa and the Middle East. Nichols makes its money by selling drinks concentrate to independent bottling companies who then make the drinks and sell them in local markets. Vimto has long been a very popular drink in Muslim countries and is incredibly popular during the festival of Ramadan. The sales mix of the business is evenly split between fizzy and still drinks. Since 2003, Nichols has outsourced the manufacturing, packaging and distribution of its soft drinks to trusted third party contract beverage companies. Vimto is made by a company called Cotts Beverages which has five manufacturing sites in the UK. This means that Nichols owns hardly any tangible fixed assets on its balance sheet which in turn means that its capital expenditure requirements (replacing existing assets or buying new ones) are very small. As we shall see shortly, this is a major factor behind Nichols’ high profit margins, high ROCE and excellent free cash flow generation. The company takes a lot of care in monitoring the performance of its contracted manufacturers in order to make sure that quality levels are maintained and that there is no disruption to the supply of drinks to its customers. These are the main risks of handing over the production of drinks to third parties. There can be no doubt that this production model has been very successful for Nichols. It has been copied brilliantly by Fevertree Drinks (AIM:FEVR) and has been a major reason for its outstanding profitability. Is Nichols a successful business? There are many ways to define a successful business but it’s always good to look at the basic stuff first. By this I mean has the company been good at selling more drinks and making more money in doing so? 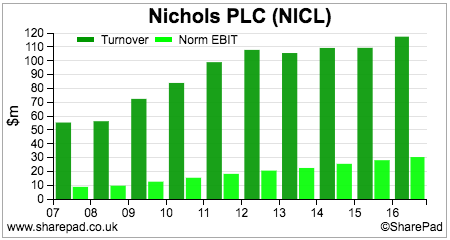 Nichols’ sales growth performance has been a little bit patchy recently. The UK soft drinks market is worth around £7.6bn in annual sales and is fiercely competitive. It is dominated by big beasts such as Coca-Cola and Pepsico with significant competition from supermarket own label products. There has been a significant amount of price competition in the market, particularly in fizzy drinks. This should be quite obvious to anyone walking around a supermarket or convenience store where there always seems to be at least one branded fizzy drink on some form of discounted offer. Trading in pubs and restaurants is also very competitive. From what I can see, Nichols has coped with the competition in the UK reasonably well. By that, I mean that its sales have not declined. 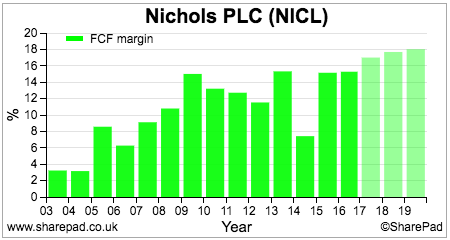 That said, it seems that virtually all of its UK sales growth in 2016 came from the Noisy Drinks acquisition at the start of the year. UK sales increased from £84.8m to £90.7m (an increase of £5.9m) but Noisy contributed £5.8m. Vimto sales increased by 4.7% which by implication suggests that the rest of the drinks portfolio is seeing sales decline. The dominance of Vimto can therefore be seen as a strength and a possible weakness of Nichols’ business as it is too reliant on it. However, there can be no doubting that Vimto is an exceptionally strong brand. This is evidenced by the fact Nichols has refused to get involved in a price war with its competitors and has followed a strategy of growing the value of sales ahead of selling more drinks. This is clearly paying off as Vimto sales in the UK increased by 10% during the first six months of 2017 and were still growing at a rate of 9% as of the end of November. One of the big advantages that Vimto has is that it is sold in different formats – fizzy, still and cordial – which means that it has more to go at in terms of driving sales. The company seems to be good at innovating the product by bringing out new flavours and promoting the brand with different types of consumer such as through vending and dispensing machines used in leisure markets. Vimto therefore looks to be in good health with the strong sales momentum expected to continue in 2018. Overseas sales into Africa have been growing nicely but unrest in the Middle East had blocked the key Yemeni supply route at the end of 2017. A weaker Saudi Arabian economy has also seen lower demand for Vimto concentrate which will see lower profits from this market in 2018. The strength of Vimto, discipline on pricing in the UK, overseas sales growth and the benefits of an outsourced production model have allowed Nichols to produce sustainably high profit margins – a sign of a high quality business. This has been a very good performance especially against the backdrop of increasing cost pressures in the soft drinks industry. However, analysts are currently forecasting margins to fall back slightly over the next few years as profits are not expected to grow much. These high margins contribute to a very high return on capital employed (ROCE). Note the increase from 2003 onwards when production of drinks was outsourced. 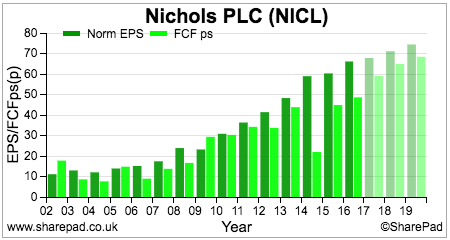 ROCE has tapered off in recent years but still remains at a very high level. The fall in ROCE can be explained partly by the acquisition of Feel Good Drinks in 2015 and Noisy Drinks in 2016. A company’s free cash flow can move around from year to year due to changes in working capital and capital expenditure requirements. Generally speaking, the company is reasonably good at turning its profits into cash although cash flow is slightly less than profits due to the increases in trade debtors (sales on credit). This is acceptable and not a sign of over trading or aggressive accounting in my view. Nichols’ free cash flow margin – free cash flow to shareholders as a percentage of turnover – has been good at around 15% during the last couple of years and is expected to improve according to forecasts from City analysts. In terms of financial performance, Nichols compares well with its peers in the sector. 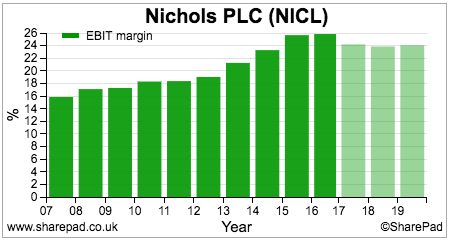 It is not far behind Fevertree’s stunning profit and cash flow returns and has very little debt – just a small but manageable pension fund deficit. 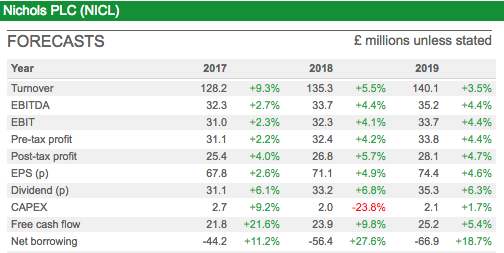 The difference in profit margin and ROCE performance between Nichols and Fevertree – who both outsource production – and Britvic and AG Barr who don’t is very significant. Perhaps the latter two companies should consider following the same business model? Maybe they prefer to have greater control over production or licensing arrangements prevent them from doing so. Nichols’ share price has been falling due to problems with its Middle East sales announced at its trading update in December. It has been unable to ship concentrate to Yemen due to the conflict in that part of the world, whilst a slowing Saudi Arabian economy is seeing slower demand for Vimto. Despite the success of Vimto in the UK, pre-tax profits are unlikely to grow in 2017 and will see low single digit percentage growth in 2018. This outlook seems to be reflected in current analyst forecasts. The shares have fallen by more than a quarter from their 52 week high of £19.58 seen last spring. Yet they still trade on a one year rolling PE of over 20 times which doesn’t seem to represent great value given the sluggish outlook for profits growth. 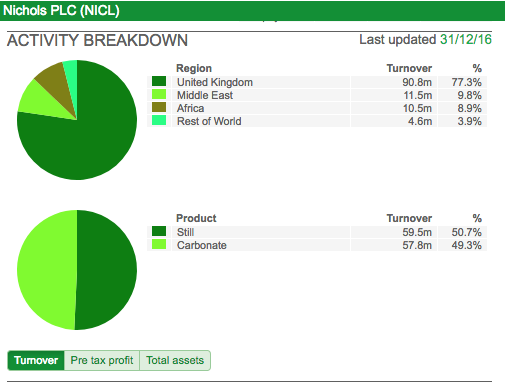 I have to say that I quite like the look of Nichols as a business and its high levels of profitability. 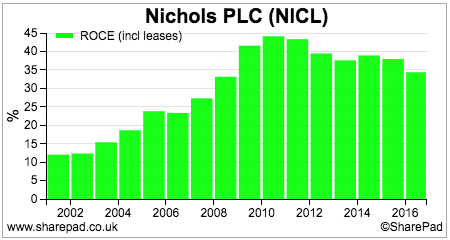 But without meaningful growth, I’m not sure that the current share price represents an attractive buying opportunity. It is also slightly concerning as to how reliant the business is on Vimto for its sales and profitability. Its recent acquisitions and other brands don’t seem to be contributing too much. Vimto is clearly an outstanding brand and one that rival drinks companies would probably love to own. 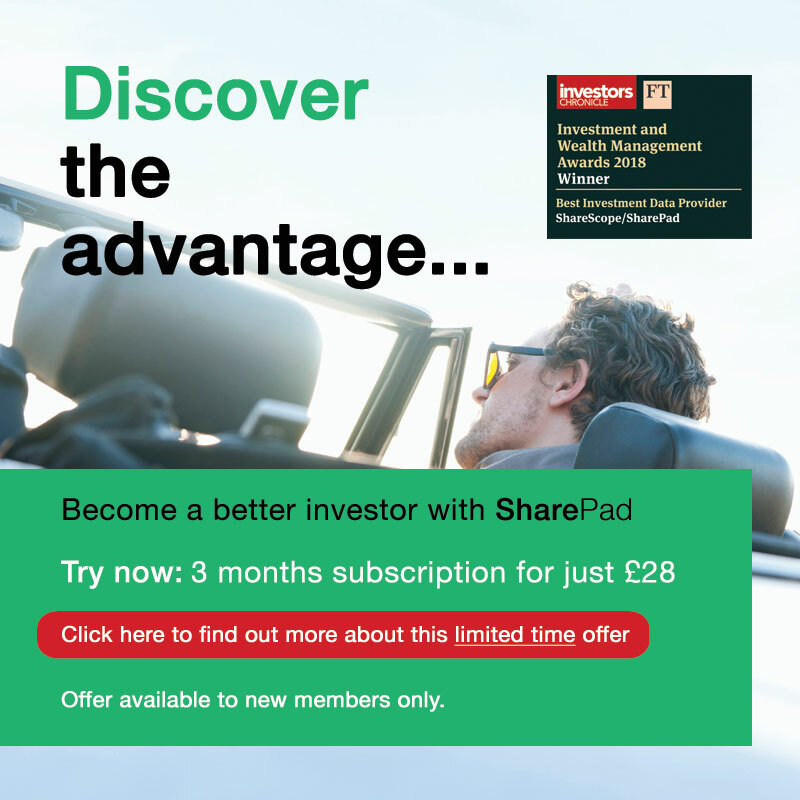 This could make Nichols a potential takeover target but perhaps the share price would have to fall further for this to become a possibility as getting the maths to stack up for an acquirer – in terms of return on investment and EPS growth – would be difficult by paying a 25-40% takeover premium to the current share price.